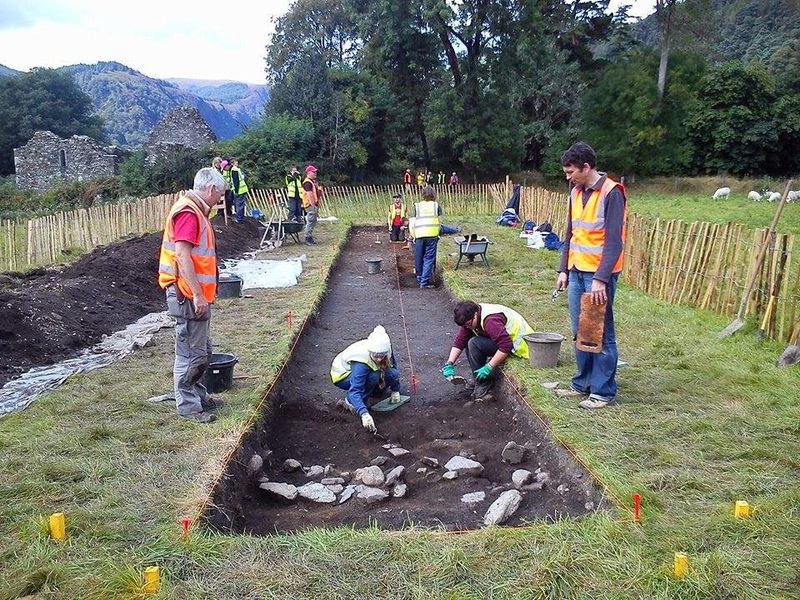 We move onto day 2 of the excavations at Glendalough with the cleaning back of both trenches 11 and 12. The de-sodding and quick clean back left the second year archaeologists with a nice surface to begin working with. Both trenches were then troweled back, followed by mattocking taking place on the eastern and western corners of the trenches. The mattocking was undertaken in order to remove what remained of the topsoil and bring us onto a richer orange-brown soil. Trench 12 presented similar finds to that of trench 11 with different types of ceramic, glass and clay pipes being found. In contrast to the previous trench however iron nails, a small black bead, two flint pieces and animal bone were uncovered. Unlike trenches 11 and 12, trench 10 told a different story. The morning allowed for desodding of the trench with a clean back which revealed more stones associated with the three originally found. The stairway however which was originally thought of is seeming increasing unlikely, with more stones appearing along the Pattern Bank which does not fit the structure of a staircase. Examining the area around the trench has shown that many stones are protruding from underneath the grassy bank.. With the only find of the day being a single coin there is still much work to be done to influence our interpretation of the site. All in all day 2 has been widely successful for all parts of the excavation.